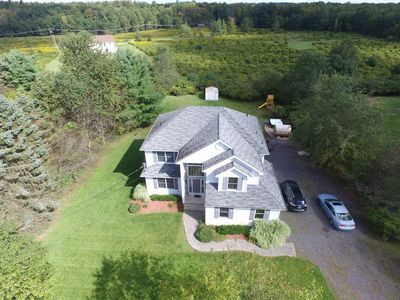 This 2500 sq ft 5 Bedroom home has 3 baths, open concept living- dining room, a family room with a gas fireplace, and a game room. 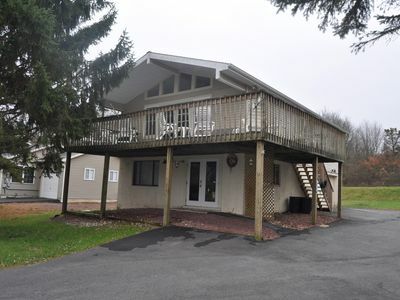 Lays on a beautifully scenic 0.5 acre large flat yard that is equipped with a Gas Grill 6, Person Steam Sauna, 7 Persons Hot tub and a Playground set. Comfortably sleeps 16. Central AC, Heating. 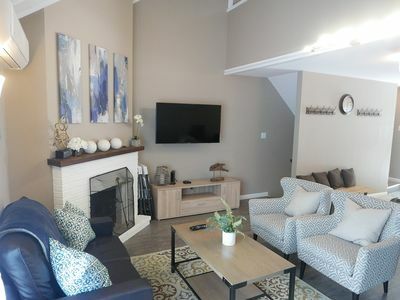 First floor features a stylish decor family room with a large gas fireplace that gives off a romantic vibe. Comfortable couch converts into a full size bed with an additional memory foam mattress pad added for your comfort. The amazing glass doors lead a welcoming entry into a large eat in kitchen with a Breakfast Island which comfortably seats 6 guests. Fully stocked kitchen equipped with all brand new stainless steel appliances. Dining area has a large table that generously seats 8-10 people. 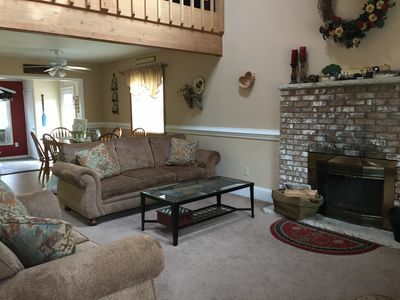 Living room features a wall mounted 65" 4k LED Curved TV with high speed WIFI and a large relaxing sectional couch that also converts into a full size bed with additional memory foam pad added for your comfort. 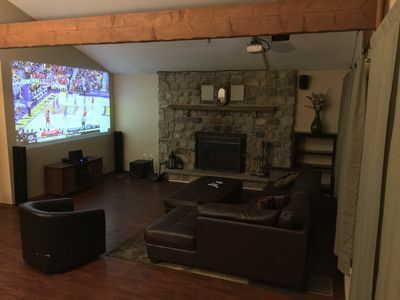 A large game room will provide entertainment for all the guests of any age. Featuring Billiard table, foosball , air hockey table and a sit down bar. Bathroom with a stand up shower and laundry room are also located on the first floor. 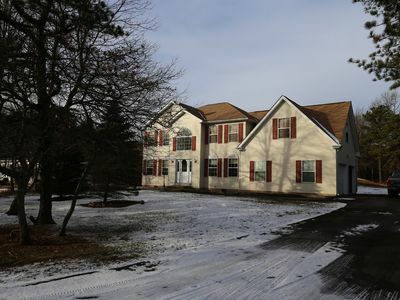 The second floor welcomes you into large 5 bedrooms. Master bedroom is designed with a separate large private bathroom with a jacuzzi tub and a stand up shower. . 4 Bedrooms include brand new queen size beds with memory foam mattresses. Master bedroom also has a baby crib with a spring mattress . 1 bedroom has full over twin bunk bed. Conveniently located additional full bathroom with a sit down tub available. 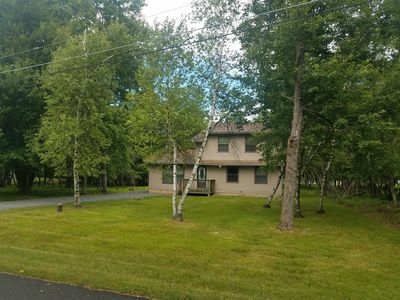 The rear deck is equipped with a BBQ Grill and cooking utensils with outdoor patio furniture that will meet all of your cooking needs while overlooking this unique beautifully scenic Pocono property. 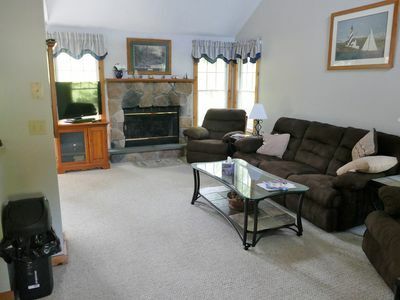 - 2500 square feet with 5 bedrooms, and 3 bathrooms. - Four Brand new Queen beds w/ memory foam mattresses, 2 full Sleeper Sofas w/ memory foam mattress pads, 1 full over twin bunk beds w/ memory foam mattresses and an Infant Crib. -Game room with Foosball, Air Hockey, Pool Table, and Sit down Bar. 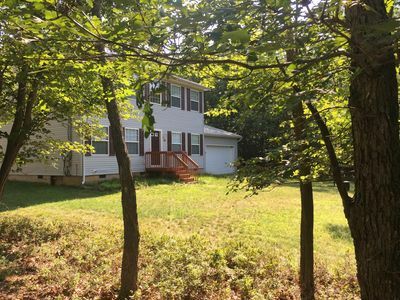 If you love nature and beautiful scenic views this community is where you want to be. Not only do we have the six lakes, but we also have plenty of wildlife and interesting plants and wildflowers. Enjoy the spring blossoms and flowers, the early summer mountain laurel blooming or the mid summer rhododendron. 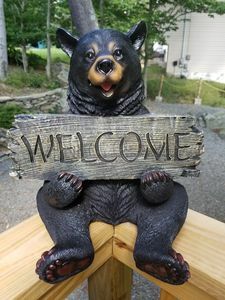 Our community is filled with wildlife such as deer, bear, fox, beaver and raccoons. These critters will give you plenty of great photo opportunities if you are patient. 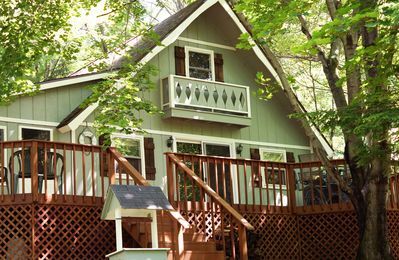 Make sure you take advantage of the natural splendor and sounds of the birds chirping. 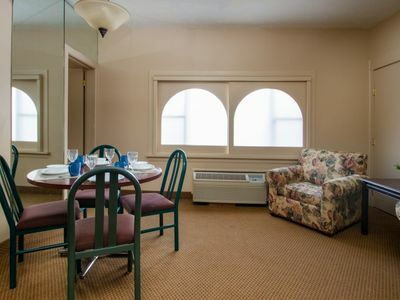 Our Community recreation amenities which also include 2 beaches complete with bathhouses and playground facilities, an indoor and outdoor pool, as well as a tennis complex and basketball courts. 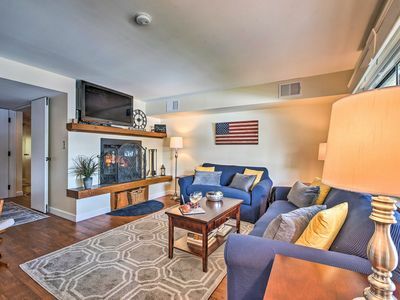 With all the amenities listed, there are plenty of activities and attractions nearby. 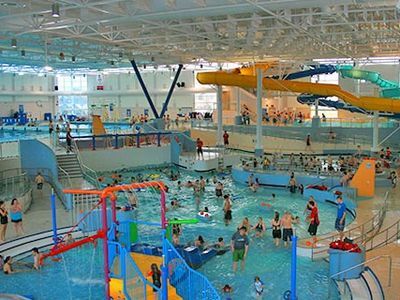 • Main shopping plaza with over 100 stores (less than 10 miles) " The Crossings"
• Delaware River (Delaware Water Gap)-Tubing, Rafting, Canoeing and Kayaking at Delaware River Tubing . 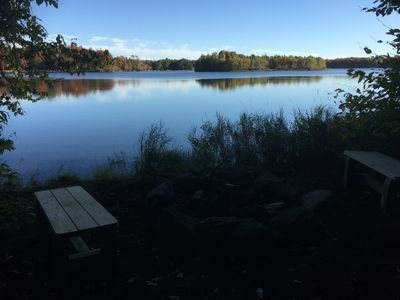 • Boating & Fishing - The house is surrounded by 6 lakes and many types of fish are found in the lakes to include pickerel, carp, bluegill, crappie and panfish. However, the most popular is the bass. The lakes are stocked each year with bass and are a catch and release only. Everyone is required to obtain the appropriate Pennsylvania State license to fish the lakes. Can be purchased at nearby Walmart. • Main Beach - This beach area is located on East Emerald Lake off Sage Road (a few minutes from the house). 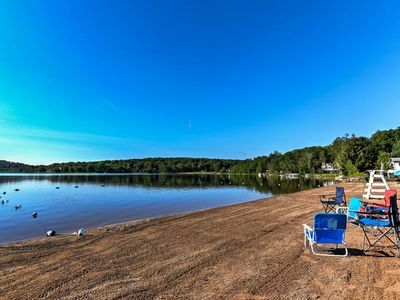 You will find a groomed beach area with roped-off swimming in the lake. The facility also includes a restroom building, children’s play structure, picnic tables and boat racks with a launch area. Must be over 25 and staying in the home to rent. We will be sending additional paperwork to the booking guest including house rules, liability waiver, and rental agreement. You will need to provide Drivers License and the Licence plates of the vehicles that will be on the property during your stay. LAKEFRONT ⛵10KAYAKS! !🚣‍,3SUP BOARDS,2BOATS,13🚴‍♂️, pa, gateway,enjoy&relax! 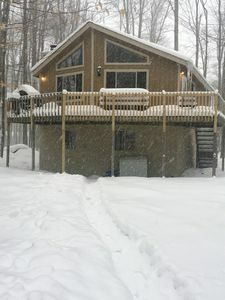 Stream Side Mountain Lodge & Hot Tub, near EVERYTHING - Family & Pet Friendly! 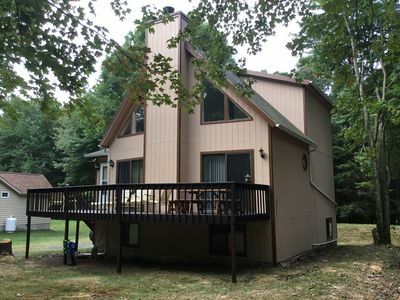 Our 5BDR Pocono house pursue your happiness. 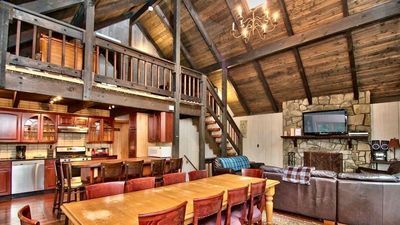 Arrowhead Lake Home w/Pool, Beach, and Rec Access! NEW! 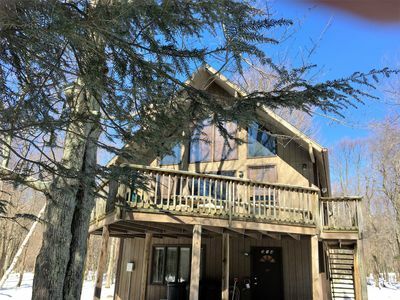 Poconos Home w/ Game Room, Deck & Fireplace!